Pierogi (Polish pronunciation: [pjɛˈrɔɡʲi]; also spelled perogi, pierogy, perogy, pierógi, pyrohy, pirogi, pyrogie, or pyrogy; juvenile diminutive form: Pierożki Polish pronunciation: [pjɛˈrɔʂki] also in use) are dumplings of unleavened dough – first boiled, then they are baked or fried usually in butter with onions – traditionally stuffed with potato filling, sauerkraut, ground meat, cheese, or fruit. Of central and eastern European provenance, they are usually semicircular, but are rectangular or triangular in some cuisines. The Polish word pierogi is plural; the singular form pieróg is rarely used, as a typical serving consists of several pierogi. Pierogi are similar to the Russian pelmeni or Ukrainian varenyky and are not to be confused with pirozhki (the Russian word for stuffed fried buns) or a pirog (the Russian word for "pie"). Polish pierogi ruskie are similar to the Ukrainian varenyky in version with potatoes and cottage cheese (quark). 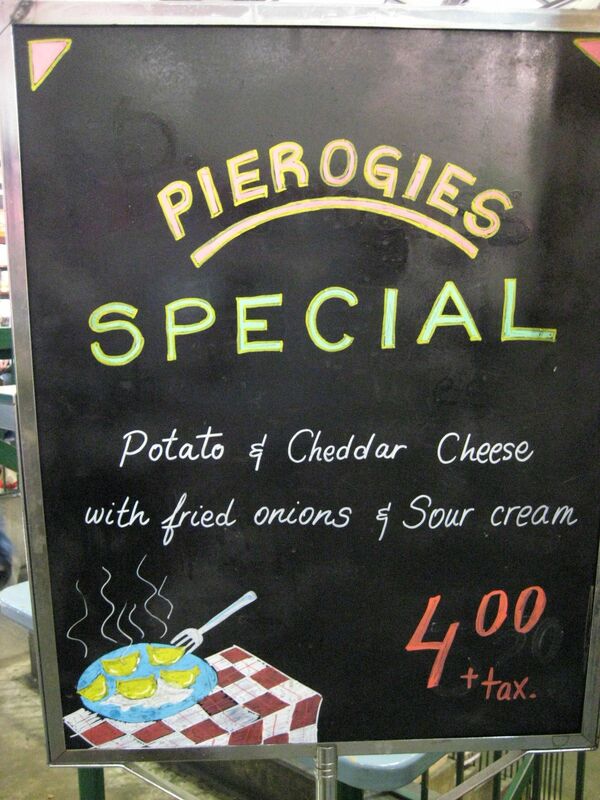 Canada has a large Polish population, and an even larger Ukrainian or Rusyn population, and their pyrohy, perogy or pyrogy /pɨˈroʊɡi/ are very common. Since Canada also has immigrants from many other perogy-making people (such as the Mennonites), a wide diversity of recipes are used. The Canadian market for perogi is second only to that of the U.S. market, the latter having been the destination of choice for the majority of Central and Eastern European immigrants prior to, and during, World War II. Packed frozen perogies can be found everywhere Central and Eastern European immigrant communities exist and are generally ubiquitous across Canada, even in big chain stores. Typically frozen flavours include potato with either Cheddar, onion, bacon, cottage cheese or mixed cheeses. Home-made versions are typically filled with either mashed potatoes (seasoned with salt and pepper and often mixed with dry curd cottage cheese or cheddar cheese), sauerkraut, or fruit. These are then boiled, and either served immediately, put in ovens and kept warm, or fried in oil or butter. Popular fruit varieties include strawberry, blueberry, and saskatoon berry. Potato and cheese or sauerkraut versions are usually served with some or all the following: butter or oil, sour cream (typical), fried onions, fried bacon bits or kielbasa (sausage), and a creamy mushroom sauce (less common). Some ethnic kitchens will deep-fry perogies, both dessert and main course dishes can be served this way. A good method is to par-boil the dumplings, then after drying, they are then deep-fried. The frozen varieties are sometimes served casserole-style with a mixture of chopped ham, onions, peppers and Cheddar cheese or with an Italian-style mixture of ground beef, onions and tomato sauce. National chain restaurants also feature the dish or variations. Boston Pizza has a sandwich and a pizza flavoured to taste like perogies, while Smitty's serves theirs as an appetizer deep-fried with salsa. Some Chinese cafés in the Canadian Prairies have taken to billing their potstickers (jiaozi) as "Chinese perogies". Although called varenyky in standard Ukrainian, speakers of the Canadian Ukrainian or Rusyn dialect refer to them as pyrohy, which can be misheard pedaheh or pudaheh by Anglophones unaccustomed to the rolled-r sound, or alveolar flap. This is due to the history of Ukrainian or Rusyn (Ruthenian) immigration to Canada, which came predominantly from the former Austro-Hungarian Empire, where the dialect had many more loan words from Polish, German, Rumanian and other Central and Eastern European languages.